Item started January 14, 2007 - Hood finished January 15, 2007. 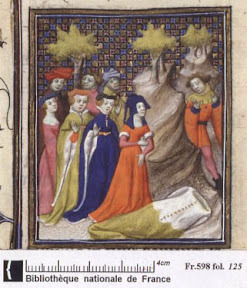 Marie Chantal's Burgundian hood site with lots of pictures. To start with, I had seen at Her Excellency Helwig's place a hood that I tried on at the time and it fit me, so I asked her about it and Helwig produced a hood - not the one I remembered seeing before, but one which fit me just fine. All it needed was a bit of a "cape" to cover the back of the neck plus the liripipe added. 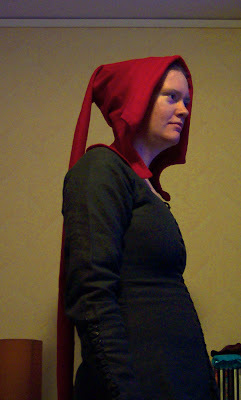 I traced the hood onto pattern paper and added my changes, then I cut out the pattern in my red wool, bought at IKEA in the distant past. In the picture to the right, I have folded in about three inches of fabric on the right, as in the configuration of the finished hood. And the fold in the fabric is along the top edge. The pattern itself is quite simple, a rectangle, extended in one top corner into a liripipe, and with the "cape" cut away from the part that goes forward of the jawbone. Plus a gore to make room in the "cape" for the shoulders. I cut this gore out of the cut away fabric. Stitching it up I had no red silk thread available so decided on using white linen thread, waxed for durability. I started by inserting the gores using an overlap of the fabric of about three millimetres, and catching the raw edges with hemstitch on both sides of the hood. (See Heather Rose Jones's Archaeological Sewing: Wool seams to join fabrics.) This worked quite well and all but hides the seam and the stitches as well as the thread. Since the hood was to be unlined I wanted to finish off the front edge neatly, so I cut the front edge twice as long as I needed it to be and folded it back on itself. Right sides together I did a running stitch down the front of the cape bits, then turned it around, topstitched along the front edge and hemstitched the overlap down all the way across the hood. The liripipe had to be pieced from the scant remnants of fabric to make up a total length from the front edge of about 120 cm. I cut out two rectangles and joined them with the same double hemstitch from the gores to the back of the hood. Then I folded the hood up inside out and ran a running stitch all along the back and down the liripipe. At the back of the head I also felled the seam allowances to either side, catching them down with running stitch, to reduce the bulk inside the hood. The seam inside the liripipe I left untreated. Voila! The hood was now finished. For images I may not have linked in the diary, close-ups and overviews et cetera please have a look at the photo gallery.